Once a large house gets built on a small lot, it’s an all too common situation when the water that once flowed or ran off in one direction is altered. This can mean standing or running water on a landscape. It’s often a result of poor drainage because the natural features which previously permitted good drainage no longer exist. In many of the newer neighborhoods, based on the fact that large houses are being built on small lots, it is mandatory for the developer to install catch basins, buried pipes, and open concrete swales to direct the runoff from the homes. Many homeowners are taking matters in their own hands as their houses are built on spaces that have extreme landscapes. Due to placing new homes on the side of a hill, on a steep slope, at the bottom of a hill, or even built into the side of an extreme hill working, with water and how it flows on a lot has become more important. Now homeowners are installing dry stream beds that take care of directing periodic water flow as well as offering a visually interesting and beautiful focal points for their landscapes. They are lining dry creek beds with well-worn stones or boulders and softening the edges with plantings that catch the eye. It’s hard not to alter the movement of water across a lot when adding a large structure where there wasn’t one before. The addition of impervious surfaces like terraces, retaining walls, roofs, and driveways restrict the flow of water across a landscape. Dry streambeds only have water in them when it is raining. They can help to retain the soil and offer runoff for rain while creating a beautiful focal point. 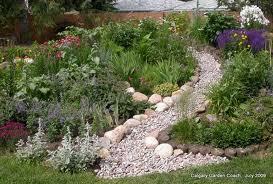 To create a dry creek bed that is functional requires a certain level of expertise. It is important to understand the variation in the elevation of the land and also to know how as the creek bed meanders through the landscape plantings should change based on the light. If you’re dealing with drainage and erosion issues due to occasional flowing water, consult a professional landscape design architect who can help you identify the source of the problem as well as recommend effective and attractive solutions such as dry stream beds.